Gov. 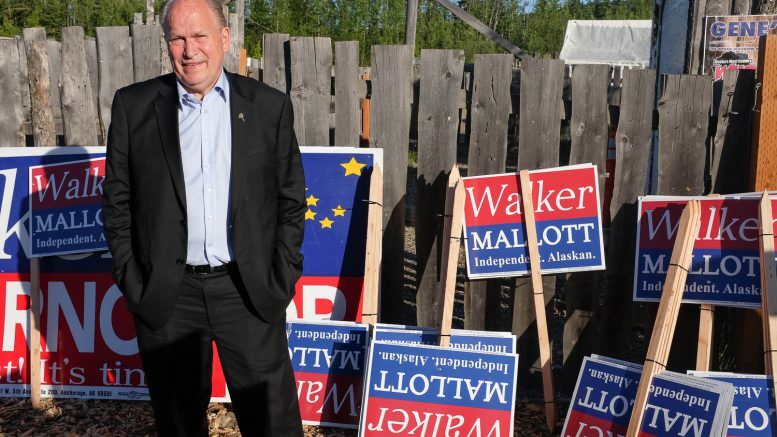 Bill Walker stands outside the Blue Loon in Fairbanks, Alaska after a fundraiser on June 20, 2018. Last week, Gov. Bill Walker stopped by Fairbanks to sign a few bills and hold a fundraiser at Rep. Adam Wool’s Blue Loon. The event was packed with the kind of people you’d generally expect to see at a Mark Begich fundraiser (the labor-friendly Democratic crowd), and there was plenty of talk about just how a three-way race will play out. As I waited for an interview with the governor, I overheard more than one person advise either the governor or someone close to him that he’ll need to get together with Democratic candidate Mark Begich to figure something out. The final day to withdraw from the general election is Sept. 4, 2018 (the 2014 Unity ticket was announced on Sept. 2). The general thinking, of course, is that a three-way race between Begich, Walker and the Republican candidate will favor the Republican. With that in mind, there was plenty to ask about how the campaign has changed since the entrance of Begich at the closing of the filing deadline and how it could change in the next few months. TMS: How has the race changed since the filing deadline? Walker: I think there’s some confusion out there. I think some people are confused about why you’d want to make this a three-way race, so I think there’s concern about what could happen in a three-way race and how that would affect one election versus another. I don’t make my decision based on what someone else does, necessarily. I learned that from the first election. There was concern when a Democrat entered the race and I was an Independent and Parnell was a Republican. There was concern when Byron came in as a strong, recognized leader in Alaska, but sometimes things just work out and so I really stay focused on not being too reactionary and continue stay focused on my message and what I want to do and what I want to do for Alaska. Our base draws from Republicans, it draws from Democrats, it draws from Independents. That’s an advantage that I have, we have–Byron and I have–our base is very broad. It’s not just one group, so I think we stay the course and continue to do work all the way up until December 1. TMS: Have you changed anything campaign-wise since the filing deadline? Walker: We set our course before and don’t really see a reason to change. I don’t go out and adopt a different message because someone else has gotten into the race. I had plenty of time to think about why I’m doing what I’m doing that I don’t have to go out and create a new platform of some sort. I’m really not deterred at all. It makes it somewhat more complicated and we’re going to have to work harder, which is fine. I’ve never got anything without hard work. You know, when I started out (in 2014) the first poll showed me at 2 percent and wiser people than me said you need to drop out because at 2 percent there’s no way you can climb that mountain, but we did. TMS: You’ve been campaigning in earnest for a few months now, has it been all about the PFD on the campaign trail? Walker: Not necessarily. It depends on where you are. There’s a lot of interest in resource development, a lot of interest in the gasline, a lot of interest in education, a lot of interest university. It’s much broader than just the PFD issue. … The vote taken by the Legislature was one of the most significant votes, I think, in the history of the state. It’s one that’s very bipartisan, especially in the House. You just don’t see that on these kinds of votes. You see a very party-line kind of vote, and it was not. I give a lot of credit to Speaker Edgmon on that, to allow something to go to the floor that wasn’t party line. People could vote however they felt what was best for Alaska. I think that’s a very significant different from what we’ve seen in the past. TMS: You’re not just campaigning, but you’re also continuing to work on the gasline, trade relations with China and everything else. What’s your motivation? Walker: I love to help people. I love to solve problems, and I love to be the one who comes in and resolve some of these issues. I go places that maybe somebody else might not go and some might try to avoid the potholes, and I try to fix the potholes. I try to see what can I do in this office that’s going to help somebody who’s trying to do a business that has some sort of government obstacle involved and what I can do. It’s such an incredible honor for me to be in this position–this is not something I thought I’d ever be–and I don’t know how long it’s going to continue. Some people ask why don’t I sit back on the gasline, stop pushing so hard and say I’ll push it after the election. I just don’t do it that way. I’m going to push as hard as I can because if I’m not re-elected, I want to make sure that it’s far enough along so it will happen on its own without me. I don’t want to leave it something undone. As I said many times: I’ve never framed half a house or sheathed half a roof. I’ve always finished everything I’ve done and I want to finish it to a point where it’s under construction and it’s happening. I have just as much passion about public safety, OCS, domestic violence, sexual assault as I do on the gasline. Nothing suffers as a result of that, but I feel my responsibility is try to bring a resolution to as many things as I can during my time in office. If it’s four years so be it, if it’s eight years then that’s the kind of passion I’ll continue on. For me, I’m just not a very good politician–and I’ve proven that many times–because I just do things that a good politician would not do. Some things I’ve been advised to stay away from and I just haven’t–fish is one of them. I get very involved in the fish issues because I think from my position I might be able to resolve some of those issues. I just keep getting back in the ring because however that round ends, that’s what you’re supposed to do as a governor. TMS: What are the big goals if you’re elected another term? Walker: I think closing out the fiscal situation is important. Being within 20 percent is great, but we’ve got to close that out one way or another. I think that what we have developed in the way of relationships worldwide is something I want to make sure that is fully developed–that we really begin to prime that pump of opportunity. That’s my job as governor and that’s why I wanted to take 50 Alaskans to China, to let that begin. There were craft brewery guys, the people that make Bambimos Baby Food, the seafood folks, the travel industry folks. I wanted to let them build those relationships and grow. I’m an opportunity-planter and let them cultivate and grow that opportunity. TMS: What’s your biggest regret or missed opportunity from the first four years? Walker: My biggest regret is that we ended up with the Legislature appropriating $14 billion of one-time savings money with no mechanism to replace that while waiting to make a decision. I would have loved to have that $14 billion either put into the permanent fund–which would have been absolutely phenomenal for the earnings–or used for infrastructure or something other than the operation of government. It took a lot longer than I thought it would. The math worked, but the politics didn’t quite work. TMS: Do you think this race will be a three-way race at the end of the day or is there a chance to be a two-way race? Walker, laughing: You mean as far as Begich and Dunleavy getting together and forming a unity ticket? They sound pretty similar and talk about the same things. But I don’t know, I don’t really know. There’s a couple options available for that to become a two-way race, but only time will tell. 1 Comment on "Walker says he’s staying course after governor’s race turns into three-way: Interview"
So you regret your decision to back out of the primary AFTER declaring you’d run in it? …But in this instance, I decided not to run in the primary because Begich got in, and I thought I could get ppl mad at him if I said the three way race was his fault?